In his January 2008 speech following his defeat in the New Hampshire primary — the one will.i.am set to music — Barack Obama insisted, “We are not as divided as our politics suggest … we are one people, we are one nation.” That conviction, to say the least, has been sorely tested during Obama’s presidency. It has been especially strained during a presidential campaign in which Republicans nominated a race-baiting demagogue for president. And last night, when a gunman murdered police officers during a Black Lives Matter protest in Dallas, it appeared to reach a kind of breaking point. In the feverish late-night heat, race-baiters at the New York Post, Breitbart, and Matt Drudge stoked a race war they clearly craved. It was 1968 again, more than a few observers said. Everything seemed to be coming apart. Will Barack Obama’s Democratic Party Wage Bernie Sanders’s Class War? But the old, tattered ideal of unity may be healthier than it seemed. 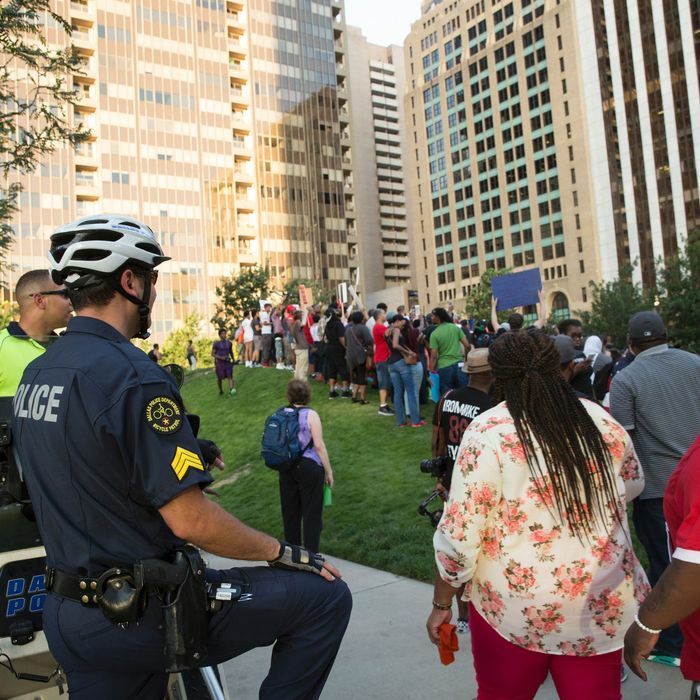 The demonstration in Dallas was the very model of a functioning liberal society — a peaceful protest against police conducted under the protection of the police themselves. Even the most radical of the protesters deplored the shootings, and the police honored the right to protest. Probing deeper, into more tender spots, one could even detect a formative consensus about the underlying cause of the protest: the routine violence by police against African-Americans. Videos of the murders of Alton Sterling and Philando Castile have not only galvanized African-Americans who have grown accustomed to the constant threat of police brutality, but they also shocked no small number of white Americans. “In the era of Facebook Live and smart phones,” wrote the conservative columnist Matt K. Lewis in the Daily Caller, “it’s hard to come to any conclusion other than the fact that police brutality toward African-Americans is a pervasive problem that has been going on for generations.” Leon H. Wolf, writing for RedState, conceded that police brutality against minorities had gone on because “a huge, overwhelming segment of America does not really give a damn what cops do in the course of maintaining order because they assume (probably correctly) that abuse at the hands of police will never happen to them.” They may not agree with Black Lives Matter on the exact scope of the problem, but the two sides have a shared sense of its existence — no small achievement in a country where the two parties cannot even agree on such questions as climate science — and broad moral contours. Among Republican leaders, the impulse to restore calm prevailed over the impulse to stoke racial hysteria. Paul Ryan praised the values of peaceful protest. Newt Gingrich – Newt Gingrich! – conceded, “It’s more dangerous to be black in America. You’re substantially more likely to be in a situation where police don’t respect you.” Even Donald Trump obliquely, and with a characteristically shaky command of the facts, conceded the need for some solution to police abuse: “The senseless, tragic deaths of two motorists in Louisiana and Minnesota reminds us how much more needs to be done.” Whatever Trump actually believed — the identification of Trump’s real convictions always being more art than science — he at least felt compelled to make some nod toward the perception that the police had gone too far. It was not inspiring, it was not ideal, but it was also more than one would have gotten from, say, circa-1968 George Wallace. It was a vindication, also, of the vision of unity Obama had attempted to summon eight years before and never abandoned. In that New Hampshire speech, the future president appealed to “Democrats, independents and Republicans who are tired of the division and distraction that has clouded Washington, who know that we can disagree without being disagreeable.” Continuing that thought, Obama built to the conclusion that he would craft a health-care reform in which the insurance and drug industries would “get a seat at the table” but “don’t get to buy every chair.” This was an oddly bloodless culmination of a poetic sentiment, beginning with an image of the people rising as one, and finishing with the mere promise to limit, but not do away with, the negotiating power of Washington lobbyists. Last year, we put together a task force that was comprised of civil rights activists and community leaders, but also law enforcement officials – police captains, sheriffs. And they sat around a table and they looked at the data and they looked at best practices, and they came up with specific recommendations and steps that could ensure that the trust between communities and police departments were rebuilt and incidents like this would be less likely to occur. There it was again — the table. As the president conceded, the discussions have not solved all of the problems of law enforcement, because, while “some jurisdictions out there … have adopted these recommendations,” there were still “a whole bunch that have not.” Change takes time. (This is another Obama belief.) But he nonetheless believed that these jurisdictions should, and eventually would, adopt better practices because it would be better for them to do so. Racial oppression, he argued, is not in the interest of police in particular or law and order in general. Giving racial minorities less reason to mistrust the police will ultimately make policing safer and easier. Dallas, ironically, is an example of the progress yielded by the kind of technocratic improvements Obama has urged on, having implemented training policies that emphasize deescalation, with notable success. If there is a single premise dividing Obama from his critics on both the left and the right, it is that intractable conflict is irrational rather than rational. The promise of reasoned, evidence-based progress is gains for all, not merely for one group at the necessary expense of others. Obama’s placid vision is obviously not a panacea. There are murderers, racists, and hysterics afoot who will not calmly gather around the table for a data-based discussion of reforms. There is an element of struggle to his vision — a contest to maintain calm, to impose order over chaos and reason over passion. The dissidents to Obama’s vision, by necessity and by definition, are loud and conspicuous. They capture our attention. But they are not the majority, and they are not bound to prevail.